Widen Bullittsville Road from two to four or five lanes to accommodate traffic volumes associated with adjacent economic development and the proposed I-275 interchange with Graves Road. 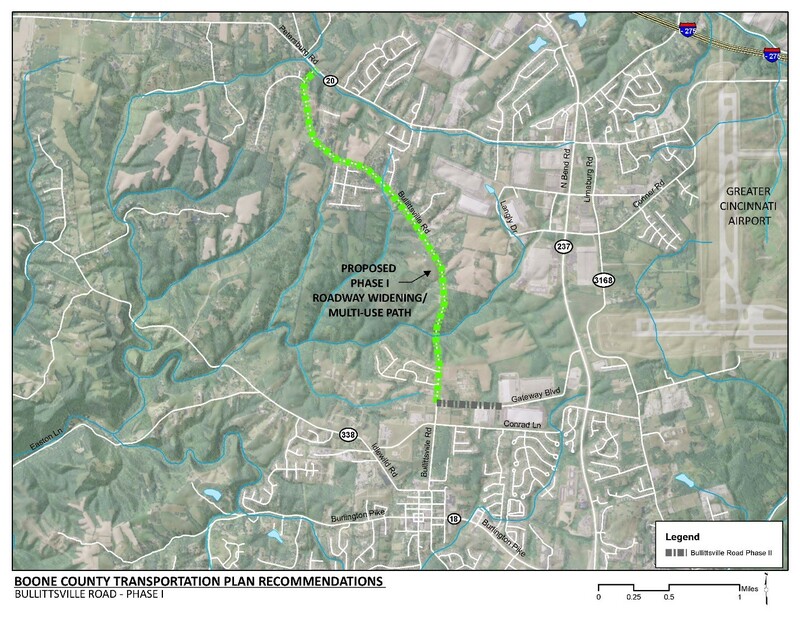 Coordinate the southern project limit with Bullittsville Road Phase 2. Increasing the number of through lanes and providing left turn storage will provide the capacity needed for the additional truck and vehicular traffic expected along this roadway. Combined with the Graves Road interchange, improvements to this route will provide improved access to I-275 and reduce the vehicular demand on KY 237. Geometric deficiencies will be corrected to improve safety. A dedicated multi-use path will provide pedestrian and bicycle accommodations and connect to other proposed pedestrian and bicycle facilities in the area. This supports Boone County’s goal of improving safety and connectivity for bicycles and pedestrians. Click HERE for a map of multi-use paths in Boone County. Potential historic sites on the National Register of Historic Places have been identified within the project area. Woolper Creek runs through the project area. Due to the addition of lanes, new bridge structures will be required to cross Woolper Creek. The addition of lanes will require acquisition of additional right-of-way. The project will require coordination with adjacent projects. These may include the I-275 interchange with Graves Road and the KY 20 (Petersburg Road) widening project. Existing Bullittsville Road is a two-lane facility. Although it connects Hebron and Burlington, it is currently used as a local route. The future interchange at Graves Road is expected to increase traffic and the proportion of trucks that will use this facility. The existing land use served by this roadway is primarily agricultural, woodlands and rural density housing. The land use expected for 2040 includes additional suburban density housing and business park use, which will increase the amount of traffic and the proportion of trucks that will use the facility when compared to agricultural and rural land uses. The number of houses within the land immediately adjacent to the proposed corridor is expected to increase by over 6,000 houses by the year 2040. The existing cross section of the roadway is insufficient for the higher volumes of truck and vehicular traffic that can be expected from the construction of the Graves Road Interchange, planned housing development, and planned industrial development. This may lead to an increase in the frequency and severity of crashes along the roadway.